A group of creators with a special interest in seeing man-made climate change thwarted come together for a series of views of what life might be like when the seas rise to levels that change life for those living near the oceans in another high-quality anthology from 3 Bad Monkeys. I've previously been impressed by the work of editor Damon Keen in putting together anthologies featuring creators from New Zealand, and this latest edition is no exception. Like the Faction series (reviews of Volume 1 and Volume 2 here), Keen not only assembles a murder's row of talent whose work complements while contrasting with each other but also ensures that the production values of the finished product are top notch. While Faction was what might be called a "deluxe paperback" style, with thick cardstock covers and glossy paper that really brought out the best in the images, High Water is a hardcover, complete with a cloth bookmark, dark red binding, and a cover by Tim Gibson that's both eye-catching and extremely well-designed. 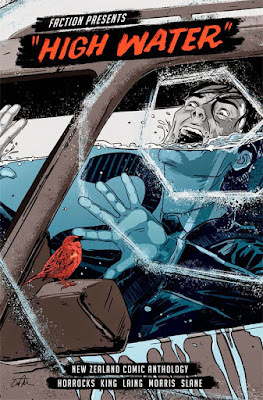 The human is almost drowning inside a car (one of the causes of climate change, while the water just keeps on going and a bird looks impassively on, knowing it can survive, while our lives will be changed forever--if not ended entirely. That cover really drives home the theme of the anthology, and it's touches like that which take a collection and move it from "pretty cool" to "that's fantastic!" Keen continues the quality control inside, where the pages are again of a thick, rich stock that allows the creators to really shine from page to page, even if their stories this time are much more somber in tone. The theme is really well explored, and I appreciate that while it's clear that none of these futures are to be welcomed, in some cases we do see humanity (or a variation of it) showing a strong will to survive. It would have been easy to just do pages upon pages of "we're screwed" but there wouldn't be any impact after the first few stories. One of the worst things a themed anthology can do is run the same concept into the ground, no matter how cool/important/interesting that theme is. Keen avoids that pitfall, going for the quality of story over making a political point. After all, let's be honest here--most of the people who are going to buy and read High Water aren't planning to vote for Ted Cruz (or the climate change denier of choice in your own home country). There's no need to convince people already on your side, and a more reasoned, measured take is the best approach to use for those who are, however improbably, on the fence about it. I think Keen made the right choice here, all across the board, in terms of not making the book entirely bleak and dire. A panel from Keen's "The Lotus Eaters"
That said, by far the most impactful story is by Keen, "The Lotus Eaters." In a series of three panel pages, Keen moves the reader across time, showing the effects of climate change at each stage. It starts off being pretty awful, then moves into disaster movie territory, and finally moves far enough into the future to envision a new chance for life on Earth, as nature proves above all that while man will surely perish, that doesn't mean that Earth itself will become a deserted husk. (That's a common mistake people make--we aren't "saving the Earth" by combating climate change. It's not going anywhere, barring some massive interstellar collision, until the Sun decides its time to gobble her children in a fiery death.) Each of the three panels is a small snapshot into what light might be like at the time, and because Keen doesn't overplay his hand, they're extremely effective. Houses crowd together making every land mass refugee camp. Soliders/police stand in ways I've personally seen them line up at protests. Nature marches on, looking a bit different each time, and going from a dried out look to more greenery, once things begin to heal millions of years on. With Keen's thin-lined style and heavy shading (looking a bit like, say, Matthew Dow Smith), it's a highlight of the book for me. "After the Flood" by Sarah Laing was another very strong story, and is a great example of the contrasting variety. Unlike Keen's thin, controlled lines, Laing uses a flowing, thick black to outline her characters, allowing limbs, backgrounds and everything else to have a slightly wavy feeling while still retaining their shape. Using markers to do the coloring (I think, it's hard to tell in these digital days) adds to the effect, giving a much rougher, organic look to the art, as the shades blend together, overlap, and bleed into the white panel borders. The plot itself features people who basically live in boats, given the scarcity of land, trying to avoid the monsters that the poisoned seas have created. A young man who has no idea what life was like before ends up being fascinated by a woman who has much more going for her. Together, they start to form a new life among the ruins. It's very uplifting, while still showing the desperate straights people might find themselves in. Katie O'Neill follows Laing with an aesthetic that's more akin to what you see in a lot of webcomics these days, looking sharp but a bit more digitally based than I'm personally a fan of. The linework and coloring is very good, but it's not distinctive. However, the story itself is extremely haunting, as a young woman who came of age as the disaster was hitting dives below the water to try to make a connection to a world that was, as O'Neill points it, "lost before anyone realized it was gone." Like Laing, her main character has to keep on living, but it's the knowledge of loss that really hammers home at the reader, given that we are probably the last generation who can do anything about it--and we aren't. That's what makes this work--there's no ham-fisted comments, just an acknowledgement of failure to act. While I wasn't overly fond of the style, the visuals chosen by O'Neill work very well here, such as the very small boat that keeps her protagonist alive, finding a dead relative among the watery ruins, and seeing how the sea is claiming that which man made. Taking a page from the more irreverent playbook, "Lowest Ebb" by Christian Pierce follows two women who are, in perhaps the only real common theme in the book, making the best of the bad situation. They quip frequently, and when they meet up with one of the few men still alive, of course he's a perverted jerk who's all about repopulating the Earth (ick ick ick). Like so many dude bros, including the ones keeping us from trying to change our climate ways, he doesn't see the danger he's in until it's far too late. It's a comedy here, but you can tell the point Pierce is making. I really dug his linework, which opens with a ruined city and keeps visual touches of the crashed society in the background. The overall look is extremely realistic, not unlike what you might see from Glen Fabry, and the style of lettering gave me an old, EC-comics vibe, though it wasn't typeset. The plot, too, would have felt right at home with Gaines and Feldstein, complete with the twist ending in which the jerk gets what he deserves. 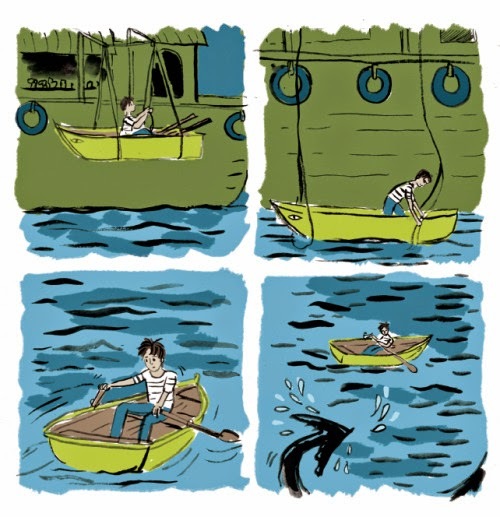 Closing out High Water is a very somber thought piece by Jonathan King, "The Luckiest Kid in the World." King uses a children's book style here, with large, picture book illustrations that start off looking like anything we might have grown up with. Smiling figures, typical homes, typical life. Bright, pastel coloring completes the effect. But then, King quicly pulls the rug out from under the reader, keeping the style but drastically altering what we see, as floods devastate and then camps and poverty kick in. It's a real kick in the teeth, and because it's not in every single story, has a major impact, reminding us that in this potentially disastrous future, life may become just as much about where you were born more so than ever. High Water is definitely a political piece, and I don't deny that. Naturally, I'm sympathetic to the cause, so that makes me a bit biased, but even if you separate this anthology from its plea to consider the dire straits we're headed in, it's still a collection of great comics, and well worth your time. New Zealand might not be what you think of as a comics hotspot, but 3 Bad Monkeys is proving that wrong, time and time again, with quality anthologies like this one that are highly recommended.